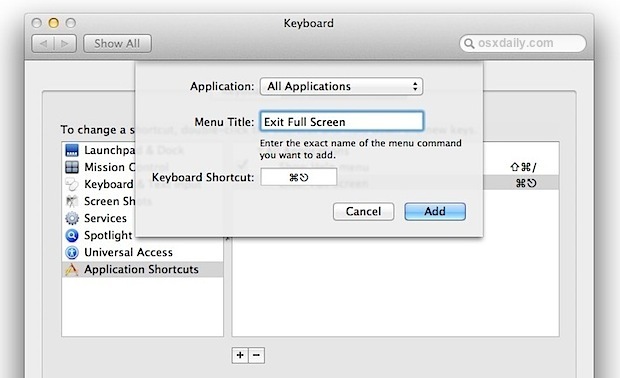 What is the keyboard shortcut to toggle fullscreen in OSX Mountain Lion? If I have a window on my desktop in OSX Mountain Lion, I see an icon in the top right corner o the window, made of two diagonal arrows pointing away from each other. I can click this to put the app in "full screen" mode and give it its own space. Once I've done that, I can hover my mouse near the top edge of the screen and the menu bar will slide down. There's a blue icon on the far right that looks like the opposite of the first: two diagonal arrows pointing toward each other. That will take the app out of full screen mode. I'm being so specific because I want to be clear about which "fullscreen mode" I mean. What is the universal keyboard shortcut to toggle fullscreen mode in Mountain Lion? I'm aware of a few application-specific shortcuts, but they're inconsistent. In Google Chrome, Command+Control+F toggles fullscreen, and Command+Shift+F toggles "presentation mode", which is the same but without showing the tabs. In Firefox, Command+Shift+F toggles fullscreen. In iTerm2, Command+Enter toggles fullscreen. I'm looking for something universal, like how Command + M minimizes the window for any app. You can try this tutorial. I'm using Mavericks, and MikO's method didn't work for me, at least not in Terminal, which was how I came to this post. BetterTouchTool, on the other hand, completely works, and, in fact, has a "Enter Fullscreen" action. Also, it's awesome. Not the answer you're looking for? Browse other questions tagged macos keyboard-shortcuts osx-mountain-lion osx-spaces or ask your own question. How can I toggle Full Screen mode in Remote Desktop without a Break key? Where can I find Wi-Fi signal strength monitor in Mountain Lion? How to move a window taller than the screen to access the bottom? How to re-enable proper full screen mode in chrome with display of toolbar on hover on macos? Why is Chrome on OSX resizing the window when the autohidden menu bar is shown/hovered instead of overlapping it?